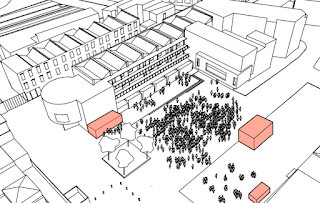 Gillett Square plans - co-operative development or gentrification? 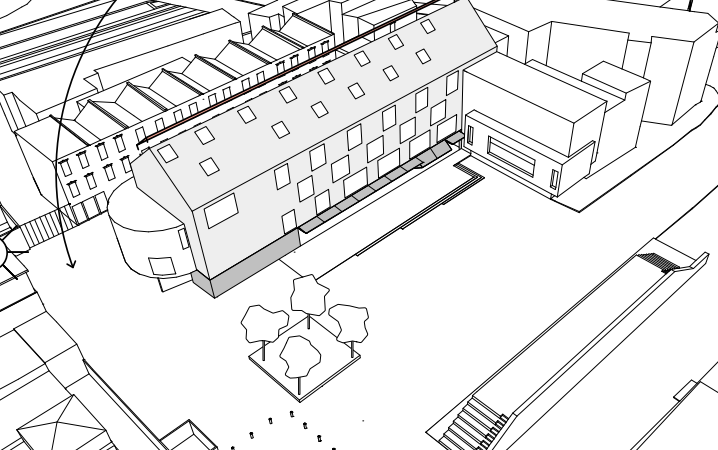 Hackney Co-Operative Developments, which owns and converted the 3-10 Bradbury Street terrace of houses to affordable commercial uses, and manages Gillett Square, has made a planning application to develop the terrace. All of its tenants ( except the shops) will have to vacate elsewhere whilst the development takes place. 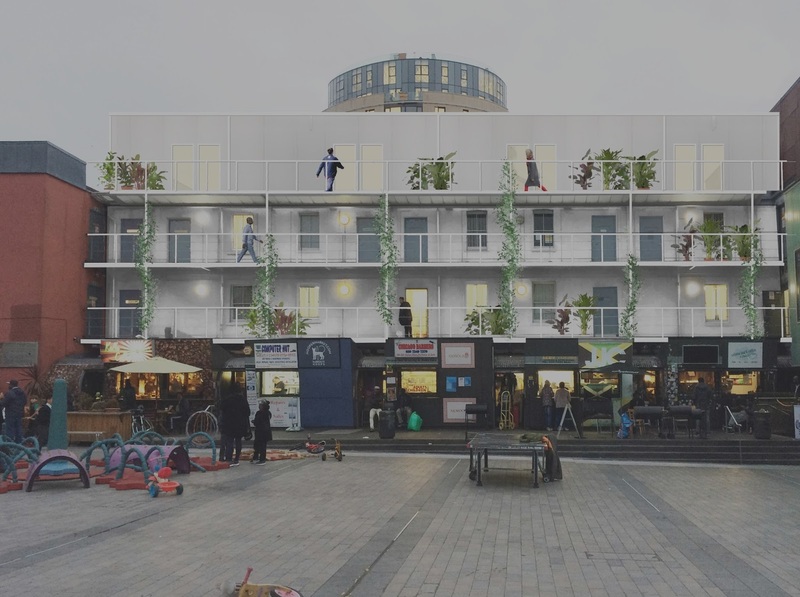 The proposal has attracted controversy.The exterior walkways, and award-winning "market-pods" which provide affordable and start-up business space, will be removed despite having won widespread acclaim and which do so much to animate the square. The new exterior finish will be one more characteristic of a glossy corporate headquarters rather than affordable work spaces for local people. 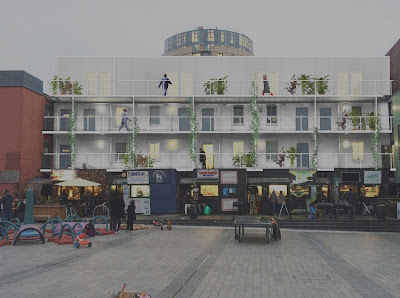 Hackney Co-Operative Developments (HCD) hope to build replacement pods on the other side of the square. HCD has been revealed not to be the model landlord one might have expected. Very few of its tenants have security of tenure and will simply be evicted if they don't accept HCDs terms for vacating. Although the development will be part-funded by public money from the GLA, HCD has refused to publish its financial viability projections for this costly scheme which produces relatively little new lettable space to justify the expense. To pay for the scheme rent rises in the future look likely . A joint letter from interested parties last October, urging HCD to adopt a more inclusive approach, was rejected. 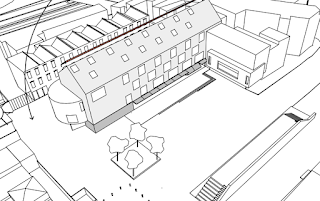 Architect's drawing of the Bradbury Street front elevations showing the new 4th storey with pitched roof on top. HCDs historic terrace is mirrored by a terrace of similar scale and period on the south side of Bradbury Street. HCD's heritage consultants comment that "The view along Bradbury Street is deemed an important View within the [Dalston] Conservation Area....[the terrace]possess aesthetic value and make a positive contribution to the Conservation Area." The Dalston Conservation Area Advisory Committee, which is composed of independent local architects and heritage experts, has commented on HCD's scheme "The proposed building is too large and too high. The volume is overbearing on the Gillett Square side, but also detracts from the collection of buildings of Townscape Merit on Bradbury Street. The dominant pitched form of the roof extension is inappropriate in the predominantly Victorian context and would damage the quality and character of the conservation area." 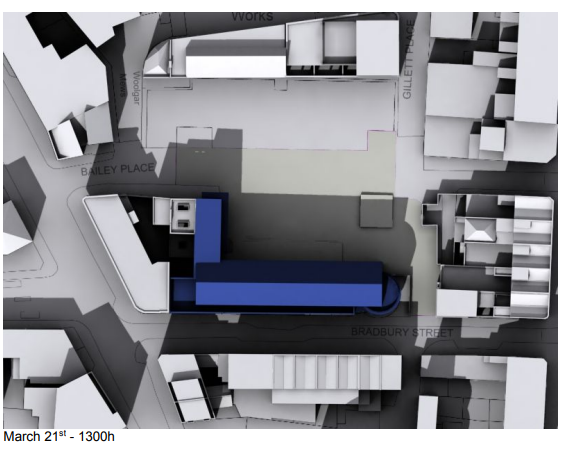 Despite the damage which the scheme would cause to the heritage value of Bradbury Street, HCD's consultants (somehow) conclude that the scheme will "will preserve and enhance Bradbury Street." 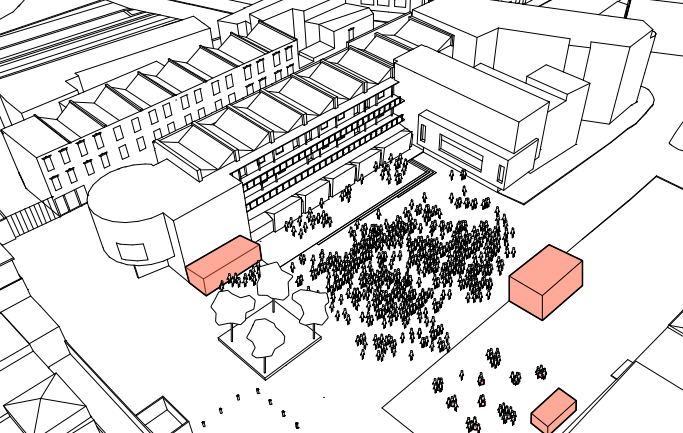 A computer modelled image of annual average overshadowing of the Gillett Square public space. Although the public open space of Gillett Square will still meet official BRE guidelines for a minimum annual average of 2 hours sunlight over 50% of its area, the new development will reduce that area by about 18%. Then, when the north side of Gillett Square is finally developed, the area of sunlit public open space will be reduced further. Here is a more modest alternative proposal for increasing affordable workspace by creating a simple mansard roof along the terrace. 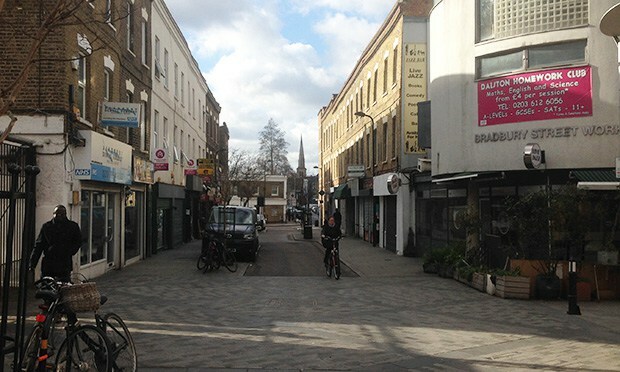 Without the high pitched roof which HCD proposes, a mansard would not dominate either Bradbury Street or Gillett Square. Neither would it involve spending valuable funds enclosing the building in plastic to create "break out spaces" which generate no additional rental income to pay for the scheme. This alternative would also leave the outdoor "market pods" in place, and the open walkways which add to the square's vitality. The alternative scheme would still generate sufficient income, from the new 4th story workspaces, to enable all the terraces facilities to be upgraded to contemporary standards. So what's wrong with that? HCD hasn't yet adequately explained its reasons for rejecting this alternative option. 2018 is the 150th anniversary of Dalston's association with the arts. Here's a new 10 minute film which tells the story of our architectural and cultural heritage from 1868 to 2018 and the risks which it is now facing. There's everything to celebrate, to protect and to conserve for future generations!